We can supply a range of machines for foil printing (hot foil stamping), both new and reconditioned. If you do not see what you are looking for on this page why not give us a call so that we can discuss your needs and find the right hot foil machine for you. Shown below is a selection of machines from the ranges we hove available, please call us if you are interrested in buying one of these machines so that we can arrange payment and delivery with you personally. We can also supply spares for John T Marshall and Impress printing machines. 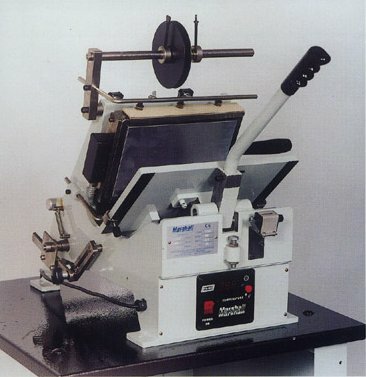 Need magnesium or brass blocks for your new machine? See our dies page for more details. Pressure, temperature, speed adjustable. Automatic document feeder. Workpiece mold with preheating. Please click for more information on this machine. Toggle action, auto foil feed & rewind and a range of optional extras available. 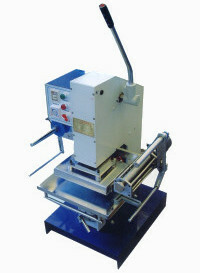 Please click to view the brochure for this machine. All prices shown are exclusive of VAT and delivery.